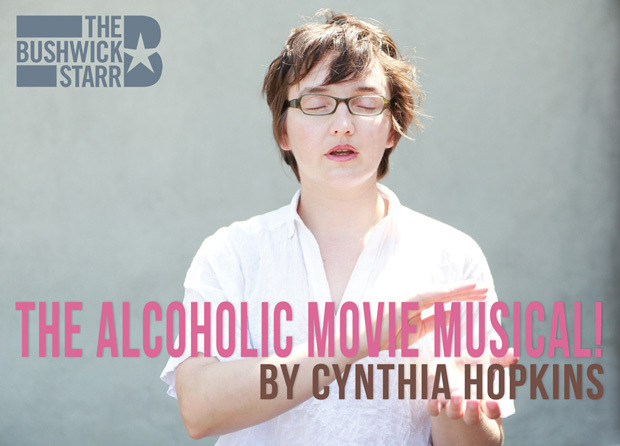 Performance artist, artist Cynthia Hopkins stars in her original work, The Alcoholic Movie Musical!, an experiment in live musical filmmaking that "draws equal inspiration from Trapped in the Closet and Dancer in the Dark. " The comedy routine about alcoholism evolves into an "operatic description of her quest to create an outlandish musical film telling her life story, culminating in a live enactment of this impossible film that is hand-made, hilarious, and harrowing." Enhanced by the brilliant design of innovative video artist Jeff Sugg (also her husband), "The Alcoholic Movie Musical! manifests through the tensile strength of live performance, greater than the sum of its parts." One of the freshest pieces of theatre out there! For tickets, go to thebushwickstarr.org.